Mount Agung is the highest mountain in Bali. Located in Karangasem regency. Including one of the mountains that are still active in Indonesia. Majestic mountains has two very different sides. The northern part of Mount Agung is quite barren, while the south is quite shady. Part of the forest around Mount Agung on fire. The fire broke since Friday in the afternoon (August 31th, 2012), until this evening fire has not been extinguished. And the fire burned most of the forest. Officers Bali provincial disaster management difficulty reaching the site of forest fire on Mount Agung. Since there is no road access to the scene of the fire. But firefighters were still trying to get closer to the location wag, because there is no road access. Known until this evening the fire was still raging in the forest, and see smoke rising from the site. Hotspots originally seen at the foot of Mount Agung. The fire quickly spread to the upper slopes. No known cause of the fire on Mount Agung. 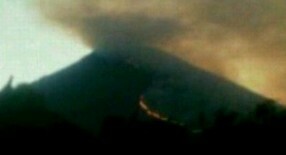 From the testimony of several people, the fire in the forest on Mount Agung occurred since the afternoon until evening. And until the fire is still burning tonight. There are many suspected causes fires are frequent in the region of Mount Agung. There is a suspect, due to friction between the tree branches have dried up. There is also a suspect this fire started with burning grass and shrubs by residents. Arson is intended to be at the beginning of the wet green grass grows later. But the assumptions of the fire caused the weather was very hot due to the dry season, and not deliberate. The fire seems obvious from the top to bottom on the east side of Mount Agung. The fire occurred at a recent Balinese Hindus perform Galungan celebrations. Thus attracting the attention of Karangasem regency. 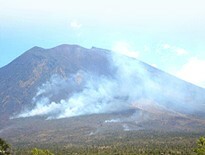 Forest fires have occurred on Mount Agung in October 2011. At that time, the fire lasted for several days, burned 60 hectares of forest in the eastern and northern slopes of Mount Agung.